No gleam of gold, no lead-cored cannon-balls, no coins, brooches or buckles and no green-glazed medieval pottery. Just flints and more flints, mostly white - found memorably en-masse on one occasion during test pits into a mound but more often found as single flakes within the trenches or particularly when out field-walking. 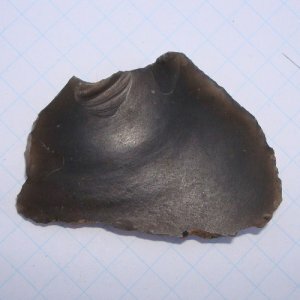 Although the flints were not highly crafted arrow-heads, knives or axes and were just small microliths or flakes, they produced in me a degree of excitement quite out of proportion to their size. They became easier to spot as experience grew, helped by the fact that they were not clarted with earth - they always came out cleanly, even in the muddiest of soils. The discovery of delicate edge tooling or, even better, microscopic saw-tooth edging, just added to the excitement. And why not? The flints were far older than anything else likely to be found on the Flodden battlefield and they gave rise to an almost mystical imagination when thinking about a Neolithic culture that existed 4,500 to 6000 years ago. At that sort of age, there is an additional buzz when realising that the finder is the first person to touch the object for several thousand years. The greatest excitement for me came when field walking on Branxton Hill Farm, with the discovery of an unusual (to me, but probably only to me) black flint flake with signs of tooling on the edges enabling it to have been used as a scraper, perhaps for use when preparing hides. Flint is very hard but is easily flaked and it can be tooled to give extremely sharp edges. It is found in the chalk deposits of south-east and eastern England and was formed 70-100 million years ago when water percolated through the chalk dissolving silicon molecules which built up to produce layers or nodules of flint. Nodules often develop a white coating over time as a result of chemical action. Flint can be white, brown or black but black flint is said to be easier to knap and is certainly very attractive in appearance. ‘My’ flint was shiny black and partly translucent when held up to the sun. It was man-made and not natural because it had the distinctive bulb of percussion that had been formed below the point of impact when the flake was knapped from the core of the flint nodule. The flint also appeared to have three ‘bulbar scars’ that were formed on the bulb of percussion by pressure waves produced by knapping. It shone in the light and seemed very special. How did it and other white flints get here? Trade with the tribes of southern and eastern England would have been by bartering in the absence of metal coinage. How was flint transported? If transport was difficult overland or by sea, lake and river, perhaps there was an osmosis of trade between south and north with flint passing from tribal area to tribal area with an additional ‘mark-up’ at each stage. Did flint come in nodular form for working on site in Northumberland? The evidence of the test pits mentioned earlier suggests that this could have happened but perhaps special ‘expensive’ arrowheads and axes were fashioned down south and brought here separately. Perhaps finished black flint tools came in special deer-hide bags, but I am, of course being overly speculative - and rather biased! * The writer did go on to find other things in later excavations but never lost that special affinity with flints.